One dictionary definition of "examine" is "to inspect or scrutinize carefully." Another is "to inquire into, or investigate." Examining one's life, then, is about taking a close look and investigating one's experiences. It's not so much thinking about one's life as it is noticing. And in noticing, you remember to be fully alive. And, speaking of examining - I'm doing a new column for the Examiner, writing about food and drink in Vancouver, Washington. In any venture, the beauty of writing is that it gives you opportunities to record what you've noticed, enjoyed, participated in. Writing these parts of your life gives you the best vista for examining who you are, what you're doing, where you're headed, where you've been. Writing keeps you in the moment, charting sights, sounds, tastes, textures, feelings. What I notice about eating, for example, is that when fully in the moment, experiencing flavors and textures, I eat less. I don't need as much food in order to be filled with an experience. It is another arena in which to indulge the senses, jot down original details, and discover new and creative sides to the "ordinary" act of eating. Do this at lunch today: Watch your spoon or fork as it dips into your soup or salad. Pay attention to the impression of your fingers on the crust of your sandwich. Notice the intersection between you and food. Close your eyes with the first bite, and really taste with your whole body. Now write any words that come to mind - crunch, zest, zip - or even concrete words that seem to be unrelated - zebra, waterfall. Relish this moment as an original experience. *I've never tried frog legs, especially cartoon ones (photo above), but stay tuned! 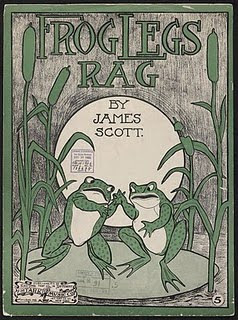 **I have more to say about frogs, over at A Fire By Night. I love this post, Christi. I've had a downer writing week and am so glad for this reminder about why we write--and the prompt to look at the extraordinary details of an ordinary lunch. Laura: eat something yummy, put your feet up, sip something even yummier, and remember what a precious and talented soul you are.